DIE Mercurii, 23 die Januarii. Report of the Judges concerning Ambassadors Children born Abroad. Fanshaw's Naturalization not to prejudice Ambassadors Children born Abroad. Protest against rejecting a Clause offered to be annexed to it. Message to H. C. that the Lords have passed Shirley's Bill; -and to return the following. Hodie 1a vice lecta est Billa, "An Act for Sale of a Messuage in Cheswicke, for Payment of the Debts of Edward Russell Esquire." The Lord Viscount Say & Seale reported the Bill for settling the Estate of Sir Seymour Shirley Baronet, as fit to pass, without any Alteration or Amendment. Hodie 3a vice lecta est Billa, "An Act for Confirmation of a Settlement of the Estate of Sir Seymour Shirly Baronet." The Earl of Bridgwater reported, "That the Committee have considered of the Bill for making Provision for such Persons and Places as are infected with the Plague; and do think it fit to pass, with some Alternations and a Proviso, which are offered to their Lordships Consideration." The said Alterations and Proviso were read Twice, and Agreed to. Hodie 3a vice lecta est Billa, "An Act for making Provision for such Places or Persons as shall be infected with the Plague." The Question being put, "Whether this Bill, with the Alterations and Additions now read, shall pass?" This Day, according to the Order of this House Yesterday, Judge Twisden reported, "That the Judges have met; and, upon Consideration of that Order, the Opinion of the Judges is, That the Children of Ambassadors (employed by the King) born in Foreign Countries are no Aliens." Memorandum, That the retaining the Name of Sir Richard Fanshaw Baronet, an Infant born in Spain (Son of Sir Richard Fanshaw Baronet, His Majesty's late Ambassador there), in the Bill for naturalizing Dame Mary Frazer and others, is according to the Direction and Desire of the said Sir Richard Fanshawe upon his Death-bed to have his Son naturalized, and not intended by this House to be prejudicial to any Children for the future, as may challenge the Privilege of being Children of Ambassadors born in Foreign Countries employed in His Majesty's Service. Hodie 3a vice lecta est Billa, "An Act for naturalizing of Dame Mary Frazer and others." The Question being put, "Whether this Bill, with the Addition of Names now read, shall pass?" ORDERED, That the Report concerning the Bill for examining the Accompts of Public Monies shall be made To-morrow Morning; and the Votes brought from the House of Commons concerning divers French Merchants shall then also be taken into Consideration. The Committee for the Bill for discovering of Lives upon Estates, and also the Committee for the Lady Abergavenie's Bill, shall meet this Afternoon. The Earl of Bridgwater reported, "That the Committee have considered the Bill for erecting a Judicature for determining Differences which may happen by reason of the Houses burnt in London; and their Lordships think it fit to pass, with some Alterations and a Proviso added." The Question being put, "Whether there shall be a Clause annexed to this Bill, to give Power for an Appeal to be made to the King and Lords in Parliament from the Sentence of the Judges?" Comes Cardigan. Ds. Howard Ch. Hodie 3a vice lecta est Billa, "An Act for erecting of a Judicature for Determination of Differences touching Houses burned and demolished by reason of the late Fire which happened in London." "By reason of the unlimited and unbounded Power given to the Judges in this Bill without any Appeal, I enter my Dissent to this Bill. 1. To acquaint them, that this House hath passed the Bill for Confirmation of a Settlement of the Estate of Sir Seymour Shirley Baronet. 1. 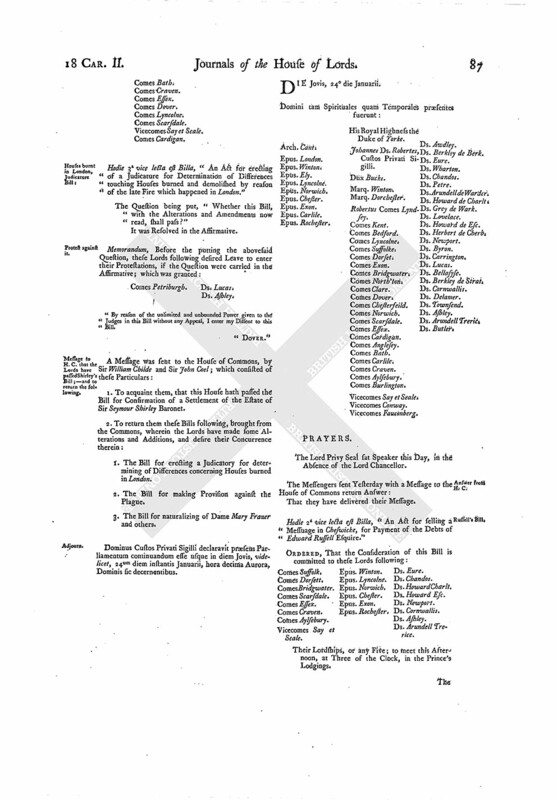 The Bill for erecting a Judicatory for determining of Differences concerning Houses burned in London. 2. The Bill for making Provision against the Plague. 3. 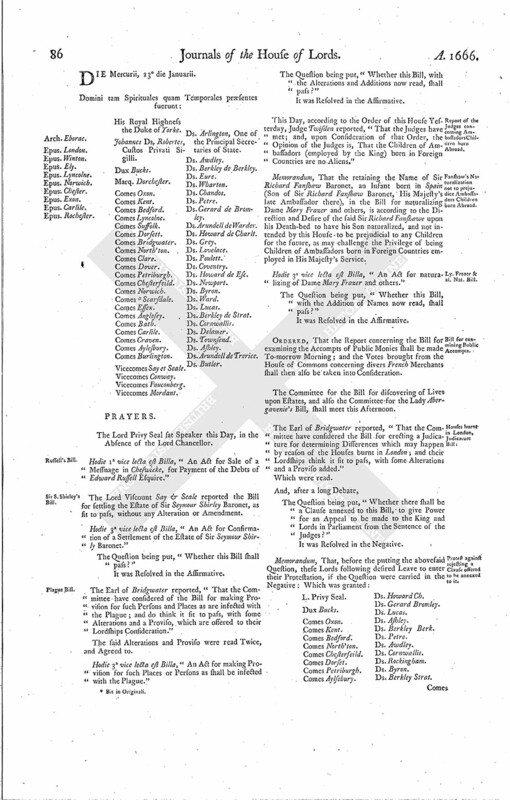 The Bill for naturalizing of Dame Mary Frazer and others. Dominus Custos Privati Sigilli declaravit præsens Parliamentum continuandum esse usque in diem Jovis, videlicet, 24um diem instantis Januarii, hora decima Aurora, Dominis sic decernentibus.